What happens when you mix Boatrocker and Whisky and Alement? A next level program of beer education! If you know your hops from your malt, or your Pale from your Pilsner, then Boatrocker Beer University is designed you to take the next step in beer education. There will be sensory tastings, chats about wild yeast, bacteria, using barrels, and even cheese matching. This is a one-of-a-kind opportunity to be tutored by the likes of Matt Houghton and special guests. All classes are just $30. 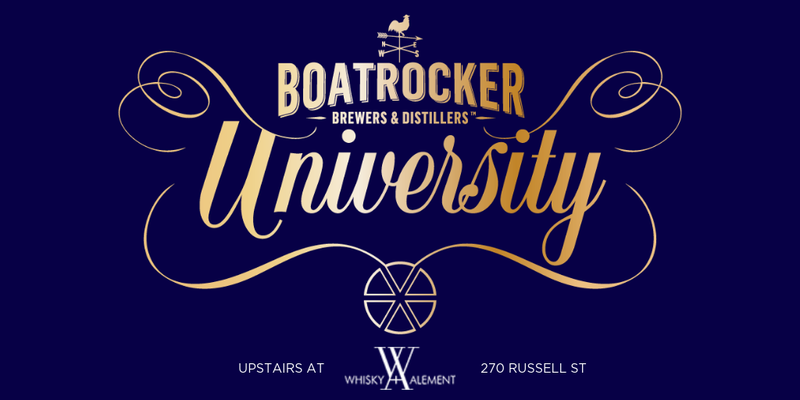 As a finale to the Boatrocker University at Whisky & Alement, we’ve got 23 double passes to give away for an epic, off-the-books, boilermaker event on the 18th of May. It's only available to Good Beer Week subscribers and will feature an amazing lineup of Boatrocker beer and Starward Whisky curated by the expert team from Whisky & Alement. This is a mind-blowing farewell to #GBW19 and you're one of the first to know about it. To be in with a chance, enter below.